In 1973, Honda, the world's leading constructor and the most ardent protagonist of the four-stroke engine, surprised the motorcycling community by presenting its first modern motorcycles with two-stroke engines, the Elsinore 125 and 250cc range of motocross and Enduro machines. The Honda Elsinore motocross 250, launched in the fall of 1972, was the marque's first two-stroke since the model F of twenty years earlier. It also conformed to Honda's "green" policy of the early 1970s, which was represented in four-stroke form by the SL125 and XL250. The Elsinore marked Honda's return to the two-stroke market in fine style by winning the American 250cc motocross championship. If the motocross versions of the Elsinore were eventually developed into production models, the trail/Enduro versions only enjoyed a short lifespan. Honda, doubtless jealous of its image as a company exclusively producing four-stroke bikes, waited until 1980 before returning to road-going two-strokes with 80cc power units while bringing out a new generation of 125cc motocross machines with different (bore/stroke: 55.5x50.7mm) engine measurements from those previously employed. 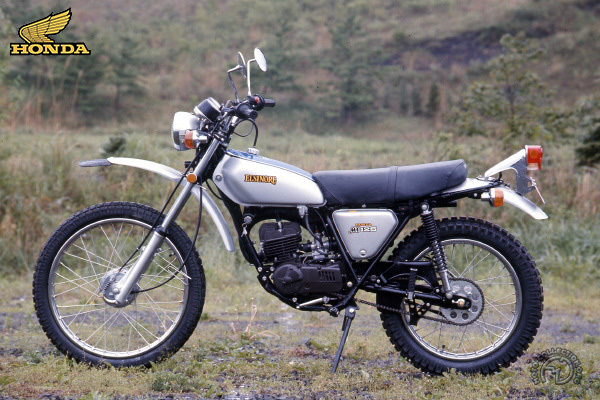 Two years later, in 1982, Honda, whose four-strokes could no longer hold off their two-stroke competitors, at last introduced its first two-stroke trail bike for general sale, the MTX125, derived from the CR of 1980.